The NCDOT has finally decided where the completion of I-540 will take place. Find out where and when the route will be constructed to see if you will be affected. 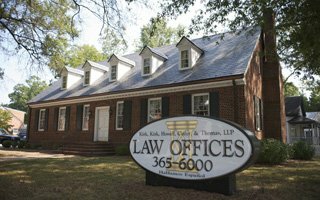 Our Raleigh lawyers have monitored this land condemnation and eminent domain scenario for the past few years and can provide legal assistance to ensure you receive fair value for your property. Most right-of-ways obtained by a condemnor (land condemning authority) are done so by a Right-of-Way Agreement. These Agreements are generated by the condemnor and presented to the landowner normally by a right-of-way agent working for the condemnor. Make sure you are not making a mistake with your signature. In the past, we have blogged regarding the NC pipeline project. Since then, the plans have changed slightly but the natural gas pipelines are continuing to be built. Do the pipeline projects affect you and your residence? If you have been contacted by Dominion or Specra, learn how to protect your rights here! Spectra and Dominion Energy companies are coming together to construct a natural gas pipeline that will cover the serving Pennsylvania, Maryland, West Virginia, Virginia, and North Carolina areas. As with any project of this scale, there is a lot of land that will be acquired for the project. Here at Kirk, Kirk, Howell, Cutler & Thomas’s eminent domain division, we will continue to update you as we learn about the details of this project. Read here for yourself! The term condemnation commonly refers to a situation where governmental entities file a civil action to take private property. Most of the time, a basic condemnation action means that the government or other entity enacts an action as the plaintiff to take over the land. This leaves you, the property owner, as the defendant. Learn what your rights are and how to protect what is yours. Has The Southeast 540 Extension Location Finally Been Decided? UPDATE: As of 2/3/2016, the NC DOT has confirmed the “Orange Route” as the approved path to complete the I-540 project. Visit our resource: “THE ORANGE ROUTE IS APPROVED FOR WAKE COUNTY’S I-540 “SOUTHERN LOOP” for more information. How Do I Know I’m Getting Fair Market Value For My Property In My Eminent Domain Case? No matter how your property is being used today, as farmland, open space, or even residential use, North Carolina law requires it be valued for eminent domain purposes based upon its highest and best use. Our firm is very familiar with the U.S. Highway 70 bypass. It will bypass Goldsboro starting near Highway 581 and connect back to Old Highway 70 near LaGrange.